Photodynamic therapy (PDT) using 5-aminolevulinic acid (5-ALA) is a skin cancer therapy that still has limitations due to the low penetration of this drug into the skin. We have proposed in this work a delivery system for 5-ALA based on liposomes having lipid composition similar to the mammalian stratum corneum (SCLLs) in order to optimize its skin delivery in Photodynamic Therapy (PDT) of skin cancers. SCLLs were obtained by reverse phase evaporation technique and size distribution of the vesicles was determinated by photon correlation spectroscopy. In vitro permeation profile was characterized using hairless mouse skin mounted in modified Franz diffusion cell. Size exclusion chromatography on gel filtration confirmed vesicle formation. SCLLs obtained by presented a degree of encapsulation of 5-ALA around 5.7%. A distribution of vesicle size centering at around 500 nm and 400 nm respectively for SCLLs and SCLLs containing 5-ALA was found. In vitro 5-ALA permeation study showed that SCLLs preparations presented higher skin retention significantly (p < 0.05) on the epidermis without SC + dermis, with a decreasing of skin permeation compared to aqueous solution. The in vitro delivery performance provided by SCLLs lead to consider this systems adequate for the 5-ALA-PDT of skin cancer, since SCLLs have delivered 5-ALA to the target skin layers (viable epidermis + dermis) to be treated by topical PDT of skin cancer. Photodynamic therapy (PDT) is a modality of experimental cancer treatment using a photosensitizer, which localizes in tumor tissue and can produce tissue destruction upon absorption of light of an appropriate wavelength and dose . The topical application of 5-aminolevulinic acid (5-ALA) followed by light irradiation is a new concept of PDT . 5-ALA is a prodrug that can be converted in situ into a highly fluorescent substance, protoporphyrin IX (PpIX), an effective photosensitizer by the heme biosynthetic pathway. The presence of exogenous 5-ALA bypasses feedback control, and thus may induce intracellular accumulation of photosensitizing concentrations of PpIX . Topical photodynamic therapy using 5 aminolevulinic acid (5-ALA-PDT) has shown to be highly efficient for the topical treatment of a variety of superficial skin malignances ; it presents advantages over conventional treatments, like surgery, electrodessication, cryosurgery, topical application of podophylin or 5-fluorouracil, and radiotherapy . 5-ALA is a hydrophilic molecule and does not easily penetrate through intact skin or cell membranes. In order to improve the efficacy of ALA-PDT, particularly in thicker lesions, a number of options have been investigated. Penetration enhancers have been used to improve skin distribution of 5-ALA into the skin  and iron chelators  have been added to enhance the production of photosensitizer PpIX. 5-ALA application and light exposure protocols have been proposed . Iontophoresis  and ultrasound  have been studied as physical methods to increase skin penetration of 5-ALA. In both case, enhanced production of PpIX in the skin was observed. 5-ALA ester derivatives which present more lipophilic properties have been synthesized, higher PpIX level in different cell cultures having been found for these compounds compared to 5-ALA itself . Delivery systems that can improve the tissue penetration and retention of 5-ALA lead to a desirable accumulation of PpIX in the skin, optimizing the PDT in this way. Lipids present in human stratum corneum (SC) are ceramides, cholesterol, free fatty acids and cholesteryl sulfate; phospholipids are absent . These lipids are termed "skin lipids" and are arranged in a bilayer sheet structures filling the intercellular space in the SC. In the topical administration of drugs, this barrier must be overcome in order to provide sufficient drug amounts at the target tissue. The properties of human SC lipids are of specific interest in this context . One of the first experimental approaches involved the examination of model lipid liposomes, the so-called SCLLs made from commercial lipids. SCLLs have been proposed as a topical drug carrier system  because their lipid composition is similar to SC lipids, which enables these systems to penetrate the epidermal barrier to a greater extent and act as "drug localizers" . The main objective of the present work is to propose a topical delivery system for 5-ALA, based on SCLLs and to evaluate its in vitro skin release profile from these preparations. 5-ALA-HCl, bovine ceramide (Type III), cholesterol, palmitic acid and colesteryl sulfate were purchased from Sigma. All other chemicals were analytical or HPLC grade. Individual lipids were combined to obtain 10 mg of a mixture containing lipids at the following concentrations (w/w): ceramide (50%), cholesterol (28%), palmitic acid (17%) and colesteryl sulfate (5%) in close approximation of the composition of SC lipids . One mol % α-tocoferol was added to this formulations, as an antioxidant. Large unilamelar liposomes were prepared by reverse phase evaporation . The lipidic mixture was dissolved in a mixture of diethyl ether: chloroform (1:1 volume ratio) to a volume of 50 mL in appropriate flask, and sonicated for 20–30 min, The temperature was maintained between 5 and 10°C using a ice-bath. After complete dissolution of the lipidic mixture, the aqueous phase (sodium acetate 100 mM buffer, pH 5.0) containing 5-ALA to yield a ratio of drug: lipids 1:3 was added. The resulting two-phase system was sonicated for 20–30 min in a bath-type sonicator and was placed on a rotator evaporator at 20–25°C to remove the organic solvent under reduced pressure. The preparation was then heated at 70°C (using a thermo barrel attached to a circulating water-bath); this temperature is above to gel-liquid crystal transition temperature of the hydrated SC lipids (Tc = 65°C). The preparation containing 5 mg lipid/mL was then extruded using a stainless steel extrusion device (Lipex Biomembranes, Vancouver, BC, Canada) at 70°C through polycarbonate filters (Nucleopore Corporation, Pleasaton, Calif, USA) to an initial pore size of 5 μm and subsequently of 1 μm. SCLLs preparations were subjected to molecular sieve chromatography on a Sephadex G-75 column (15 mm × 670 mm) at room temperature, and eluted with a buffered sodium acetate (100 mM, pH 5.0) solution. Fraction collector, at a flow rate of 0.3 mL/min collected the effluents. Absorbance measurements at 246 nm were done in the collected fractions in order to determine the elution profile of the SCLLs. 5-ALA was assayed in the collected fractions by the fluorimetric assay . Prior to the 5-ALA assay, 250 μL ethanol was added to the liposomal fractions for the vesicles solubilization. Average particle size and size distribution of SCLLs were measured by photon correlation spectroscopy with a quasi-elastic laser light scattering (QELS) instrument (laser source He-Ne, 633 nm and 90° scattering angle). Vesicle size distribution and the polydispersity index (PI) were determined with dynamic light scattering using a photon correlating spectrometer (SYSTEM 4700-Malvern). Samples were adjusted to the appropriate concentration range with sodium acetate buffer (100 mM, pH 5.0). Measurements were made at 25°C and scattering angle of 90°. Cumulative analysis of scattering data was used to estimate effective diameters and polydispersity. Dorsal full-thickness skins of four weeks old male hairless mice (strain HRS/J, Jackson Laboratories, Bar Harbor, ME), were excised and immediately mounted in a modified Franz diffusion cell, kept at 37°C. The donor medium was 0.5 mL, either a SCLLs preparations or aqueous solution containing the same concentration of 5-ALA. Isotonic pH 5.0 acetate buffer containing formalin 0.01 % (w/w) was used as the acceptor medium, from which samples were collected at regular intervals during 36 hs. Flux values were obtained from steady state portion of the curve. For skin retention study in vitro permeation experiments were performed as described above and the skins were removed from the diffusion cell after 36 h, cleaned with cotton soaked in isotonic acetate buffer (100 mM, pH 5.0), and then gently dried by pressing between two tissue papers. SC layers were removed by tape stripping method, using Scotch Crystal Tape (3M™, France). About 10 tape-strips were necessary to remove the SC from the skin samples. 5-ALA present in these tape-strips was extracted with isotonic acetate buffer. The remaining tissue (rest of epidermis + dermis) was homogenized in 10 mL of buffer for extraction of 5-ALA and filtered. 5-ALA amounts presented in the acceptor medium samples and tape strips and epidermis without SC + dermis extraction solutions were determined by fluorimetric assay . The pH 5.0 was used in the experiments because the higher 5-ALA stability in this pH. Figure 1 shows the elution profile of SCLLs obtained by the phase reverse evaporation technique followed by extrusion, as well as elution of 5-ALA. The extent of drug entrapped in liposome vesicles can be determined by column chromatography or by other methods, followed by drug assay. Liposome preparations are a mixture of encapsulated and unencapsulated drug fractions. The unencapsulated drug fraction is also referred to as "free" drug. Free 5-ALA was eluted in the fractions 15–20, distant from the void volume (Figure 1b). The elution profile of SCLLs presented by a single peak, close to the column's void; 5-ALA was also eluted in a unique peak, distant from the column's void. For the SCLLs samples prepared with 5-ALA at 1:3 drug:lipids ratio, a degree of encapsulation around 5.7 (± 0.17) % w/v was found. The vesicle size distribution determined by photon correlation spectroscopy has showed that SCLLs presented an average particle size of around 500 nm, in accordance with the size vesicle obtained by the reverse evaporation technique . In the presence of 5-ALA, it size was decreased to 400 nm (Table 1), indicating possible drug-vesicle interactions. 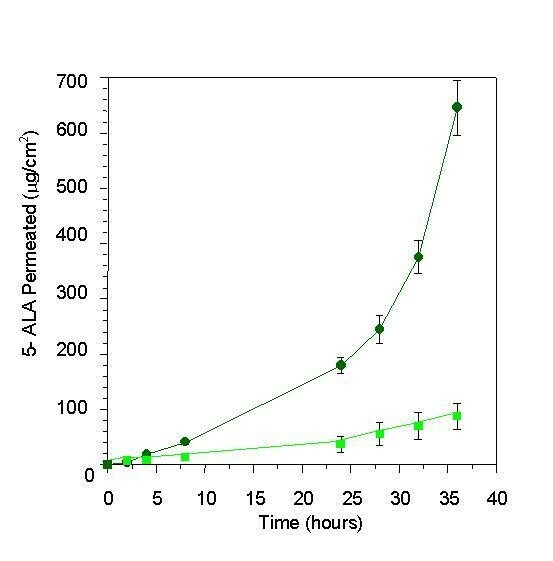 Figure 2 represents the in vitro permeation profile of 5-ALA from SCLLs and aqueous solution. 5-ALA flux through hairless mouse skin, calculated after reaching a steady state, was lower for SCLLs formulations (4.2 ± 0.2 μg/cm2.h) than for aqueous solutions (38.3 ± 2.4 μg/cm2.h). The presence of SCLLS decreased the amount of 5-ALA transported through hairless mouse skin, after 36 hours to 500.9 (± 32.5) μg, a value considerably significantly (P < 0.001) lower than 3681.0 (± 104.65) μg observed for aqueous solutions. However, the skin retention in the skin layers was increased by SCLLs formulation significantly (P < 0.05) only in the epidermis without SC + dermis in comparison with values for aqueous solution (Figure 3). Elution profile of: (a) SCLLs and (b) 5-ALA solutions using size exclusion chromatography on a Sephadex G-75 column. Amount of 5-ALA permeated (μg/cm2) through hairless mouse skin from the 5-ALA aqueous solution (black star) and SCLLs (square), as a function of time (hours). Amount of 5-ALA (μg) permeated and retained in the SC and epidermis without SC + dermis after 36 hours of in vitro permeation study. Errors bars indicate standard deviation of the mean. Statistical significance indicated by one-tailed Student's t test: (*) P < 0.05) and (**) P < 0.001. * Scattering angle of the laser beam was 90°; temperature 25°C, viscosity 0.890 and refraction index 1.33. **Polidispersity index, meaning the measurement of the homogeneity of a dispersion, ranging from 0.0 (monodisperse) to 1.0 (very heterogeneous). The obtainment of a liposomal system with a greater interaction with the cutaneous tissue based on the similarity between its lipid composition and that of the SC may be an adequate strategy for improvement of 5-ALA skin delivery. Using exclusion chromatography it was possible to verify the presence of supramolecular aggregates in the SCLLs preparations obtained in the present study. SCLLs fractions were eluted with the void volume of the column and consisted of particles fully excluded from the internal volume of the gel (7 to 10 fractions; as shown in the Figure 1(a). Free 5-ALA appeared in the fractions 15 to 20, as illustrated in the Figure 1(b). Size exclusion chromatography of SCLLs showed a single peak and vesicle formation; the individual lipids and smaller vesicles would elute in fractions distributed over the internal volume of the gel, distant from the void volume. The liposome fractions collected from the gel filtration column showed a low degree of about 5.7 (± 0.17) % w/v of 5-ALA encapsulation. This low percentage of encapsulation may be due to the fact that 5-ALA is a small, hydrophilic molecule, probably capable of leaking out of the vesicles. In the presence of 5-ALA, a significant decrease (P < 0.05) of the vesicle size to around 400 nm was observed, possibly characterizing an interaction at the molecular level between the drug and the lipids (Table 1). In vitro permeation and retention studies showed that 5-ALA in the liposomal system presented a lower permeation through mouse skin (Figure 2). Amazedly, it was observed a significant (P < 0.05) increase in the 5-ALA retention in epidermis without SC + dermis compared to aqueous solution (Figure 3). This behaviour can be explained as a probable consequence of SCLLs-skin interaction, providing a deposit effect for 5-ALA in the animal skin. In fact, liposomes have actually been referred to skin "drug localizers" . Partition and diffusion in the SC lipids bilayers are important steps to delivery drugs to the subsequent skin layers (viable epidermis and dermis) , were most of skin cancer lesions takes place. 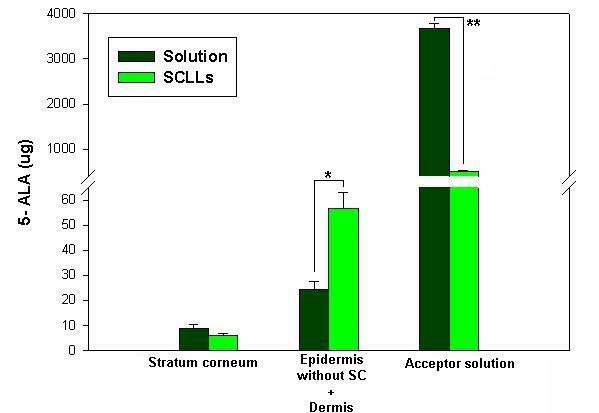 In the present work, SCLLS containing 5-ALA showed adequate retention of the drug in the epidermis without SC + dermis, with decreased transdermal delivery (Figure 3). This behaviour shows that the liposomal system based on lipid composition similar to SC lipids provided a target delivery of 5-ALA into skin tissue to be treated in the topical PDT of skin cancer. Despite the low degree of 5-ALA encapsulation in SCLLs, a suitable 5-ALA delivery into skin, as well as its slower rate of permeation were observed. These properties are interesting to ensure PpIX formation over an adequate time period and amount. Our previous work  showed that lecithin in poloxamer gels can increase skin retention of hidrocortisone acetate into hairless mouse skin; they attributed this results to the increased lipid content of the SC caused by the phospholipid, in special within the SC intercellular region. Similarly to SC, SCLLs have ceramides (50%) as the major lipid. This property may increase formulation-SC interactions faciliting thus, the partition of 5-ALA into the skin. The higher amount of 5-ALA in the epidermis without SC + dermis can be explained because 5-ALA is polar and charged. It can be partitioned promptly to the aqueous skin layers, despite SCLLs formulation is retained in the SC. For lipophilic drugs, it could find a higher retention in the SC, since SCLLs provide a favorable environment for these drugs. Other authors  have found by an in vivo stripping technique, that SCLLs showed a high affinity for SC indicated by a high amount of a fluorescent marker (sodium fluorescein), and suggesting a greater reservoir capacity of SC compared to similar lipid composition formulation (not a liposomal system). Liposome formulation based on phospholipids can interact with SC destabilizing, and fusing or mixing with the lipid matrix, acting as permeation enhancers and increasing the transdermal delivery . SCLLs effect found in the present work is desirable for topical drug delivery , in special for skin cancer treatment based on 5-ALA PDT, in which a high 5-ALA skin retention may lead to greater PpIX accumulation into the skin. Since the success of this therapy is related to the amount of PpIX formed in the target tissue (viable epidermis and dermis), more efficient therapeutic effect may be expected from its utilization. Liposomal preparations obtained using commercial lipids; the so-called SCLLs appear to be a useful 5-ALA delivery system for topical PDT in skin cancers. Considering that adequate skin bioavailability of 5-ALA is important for this therapy, SCLLs preparations provided a good performance, by a slower permeation and delivery of the drug into epidermis without SC +dermis compared to aqueous solutions usually applied in 5-ALA-PDT clinical procedure. A lipid bilayer structure, similar to SC lipid matrix is another advantage of SCLLs in favor of their interaction with the skin. Other authors  have found that these preparations permit a higher turnover of the skin barrier in comparison to a simple lipid mixture. Delivery systems that increase 5-ALA concentration in the target skin layers may improve the efficacy of topical PDT with this drug, since the PpIX accumulation is directly related to the presence of 5-ALA in the skin . The encapsulation problem found in the present work may in part be solved by the use of ester derivatives of 5-ALA , which present higher molecular weight and lipophilic characteristics than 5-ALA itself, which can provide higher encapsulation degree and infer in improved retention into the target tissue with consequently improvement of PpIX accumulation. The results obtained in this work, indicate that SCLLs formulations appear to be suitable for topical delivery of 5-ALA. Efficiency of encapsulation, stability of SCLLs containing 5-ALA or its ester derivatives, skin permeation profiles as well as in vivo PpIX production in treated skin, remain to be optimized in order to fill the gap in knowledge about drug delivery systems to be used in PDT. This work was supported by Fundação de Amparo à Pesquisa do Estado de São Paulo (FAPESP), Brazil. We would like to thank Dr. Pietro Ciacaglini for the assistance on chromatography studies. We are also thankful to Dr. A. M. Rothschild for revision of this manuscript.